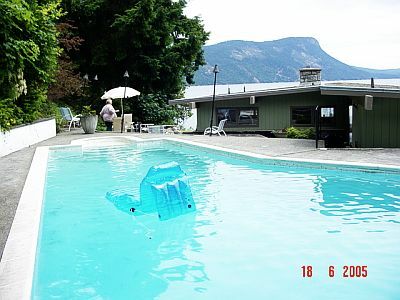 The Maple Bay Retreat is located in the beautiful seaside community of Maple Bay. 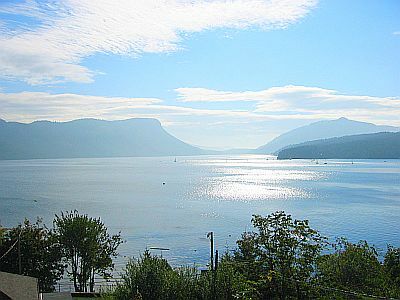 Maple Bay is one of the finest natural harbours on the West Coast of British Columbia. 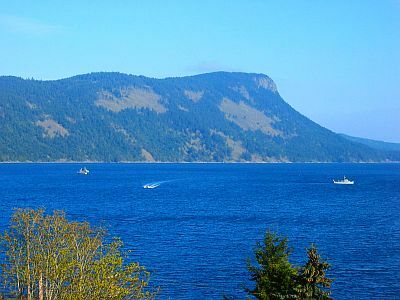 With is warm summers and moderate winter climate; there is no greater place to experience the golden sunshine other than Maple Bay. 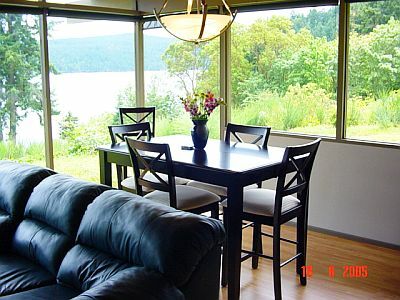 The Maple Bay Retreat home is spread out over one level and has been extensively renovated in 2005. 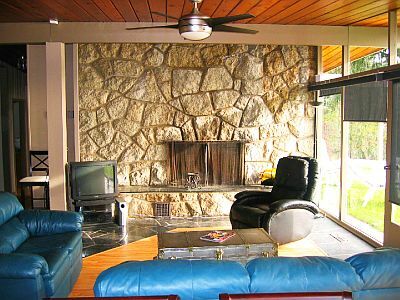 The main living space, centered by a sturdy rock faced wood burning fireplace, gives rise to an open design. Floor to ceiling windows, allow natural sunlight to fill the room and allow guests to take full advantage of the views from all areas of the house. The entire main floor is finished in maple hardwood and areas of stone. 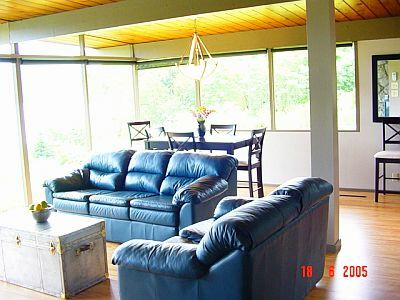 This living space is furnished with luxurious leather sofas and a lounge chair with ottoman. 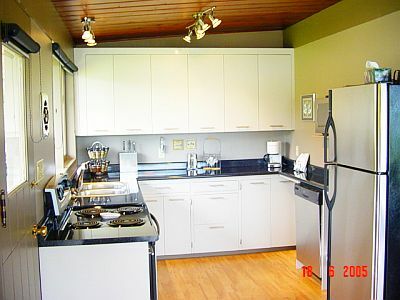 For the chef in the family, new countertops, backsplash and all stainless steel appliances decorate the kitchen area that is highlighted with under cabinet lighting. The dining area shares space with the main living area and features a contemporary cappuccino bar table that seats 8 people. The relaxed feel of this set allows for casual dining and doubles as an entertainment area for cards or games. The master bedroom with a queen-sized bed is located at the front of the house, with large windows to take advantage of the views. 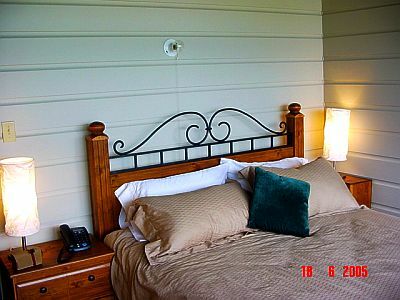 The guest bedroom is equipped with a queen bed and lots of storage space. An office can also be converted into a third bedroom with its comfortable double sofa bed. 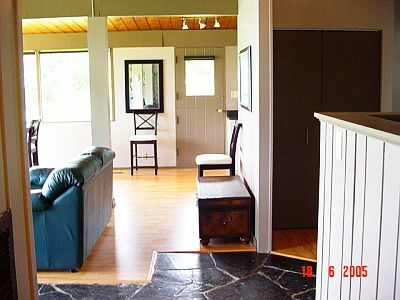 Three quarter height pony walls border this open concept room to allow some privacy. Outside decks are in a two-tier design. The first level is spacious with flowerpots, BBQ, and a fire pit. A full set of outdoor patio furniture with propane lanterns finishes the area. 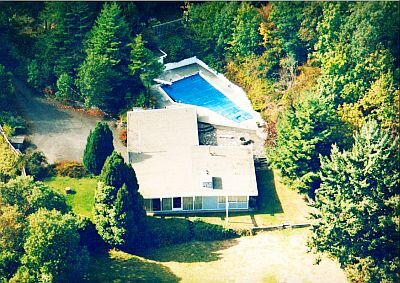 The second area contains the full size swimming pool with diving board. There are plenty activities to do for both outdoor and marine enthusiasts. 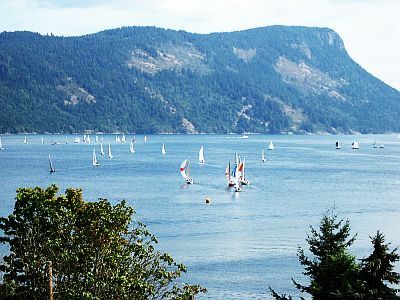 You may wish to moor your boat at one of the many sheltered marinas that dot the shoreline between Maple Bay and Genoa Bay. Canoe, Kayak, and boat rentals companies are all available nearby. Experience the city of totems in Duncan, which is only 15 minutes way, or stroll the seaside shops and attractions in Cowichan Bay. A short drive to Chemainus and see the little town that could with its magnificent world famous murals and plenty of artisan shops and galleries. Victoria is only a short 1-hour drive away where the World Famous Butchart Gardens and Royal BC Museum are sure to be a highlight of our vacation. 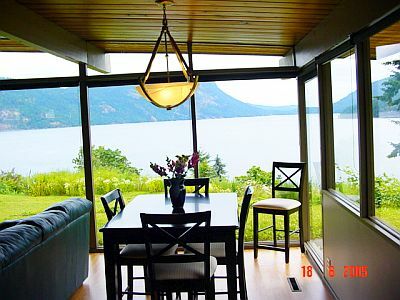 Maple Bay Retreat Great place lovely atmosphere. Look forward to staying there again.